Skoda says the Vision X's "powerful, precise" exterior styling advances the brand's SUV design language. 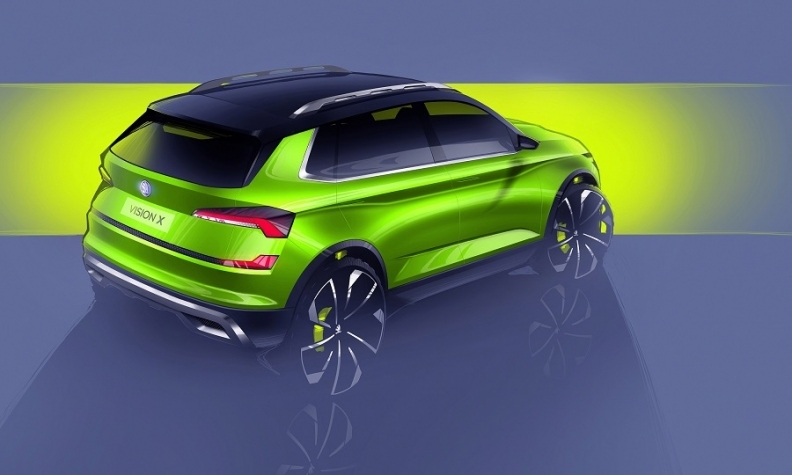 Skoda will preview a subcompact SUV with a concept to be unveiled at the Geneva Motor show in March. The Vision X concept marks the Volkswagen Group brand’s expansion into the fast-growing subcompact/crossover segment popularized by the Renault Captur. The production version of the Vision X will go on sale next year, a Skoda spokeswoman said. Currently the Seat Arona is the only VW Group model competing in the segment. VW brand plans to the compete in the sector with the T-Cross. Skoda's SUV range currently comprises the Karok compact SUV, which replaces the Yeti, and the Kodiaq, its first large SUV. Skoda described the Vision X as a modern crossover that will appeal to customers with active, urban lifestyles. It said the "powerful, precise" look of the exterior styling advanced the brand’s SUV design language beyond that of the Kodiak and Karoq. The Vision X's interior updates Skoda’s current dashboard design to include a prominent free-standing screen. Skoda described it as “fundamentally” changing how the interiors of its vehicles will look. The concept car will have a hybrid drivetrain that pairs a 1.5-liter engine powered by CNG (compressed natural gas) with an electric motor driving the rear axle. A smaller gasoline tank would give the car extra range, Skoda said. The brand is rolling out electrified cars as part of its Strategy 2025 plan. Models will include five all-electric cars as well as plug-in hybrid alternatives by 2025.